And then, it occurred to her. 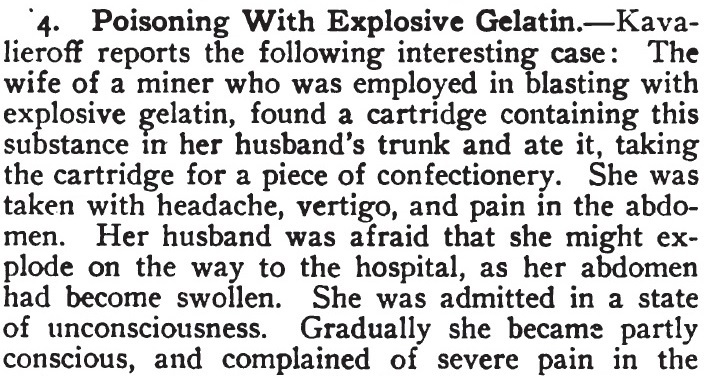 In view of the fact that explosive gelatin [...] gives off a quantity of nitrous acid vapors while decomposing, the stomach was washed with a solution of sodium bicarbonate, and a number of bubbles of gas escaped. A dose of castor oil was poured into the stomach tube, the patient was given a subcutaneous injection of caffeine, sodium benzoate, and ergotine, and coffee internally. The patient had a copious evacuation and quickly recovered. The symptoms, therefore, were those of poisoning with nitroglycerin, amyl nitrite, etc. The dose of nitroglycerin taken by this patient was two ounces, or six thousand times the therapeutic dose. Also, if you do ingest delicious dynamite, make sure to not light your farts, or you might give a whole new meaning to explosive diarrhea!